If anything captured the essence of this year’s Chino Hills boys basketball season, it was the opening minutes of the team’s play-off game against Mater Dei in late February—a game that would help determine the best high school team in Southern California. The showdown pitted Chino Hills, a public school that has been in existence for only 15 years, against Mater Dei in Santa Ana, one of the largest Catholic high schools in the country. In past years Mater Dei, whose fabled basketball program holds a record 22 Southern Section championships, had dominated the play-offs. But this year would be different. Having scored 100 or more points in 15 of its first 29 games—3 games shy of the state record—Chino Hills was not only unbeaten but ranked number one in the country. Virtually everywhere the team played, its games sold out as fans rallied to witness the ascendance of a basketball royal family. 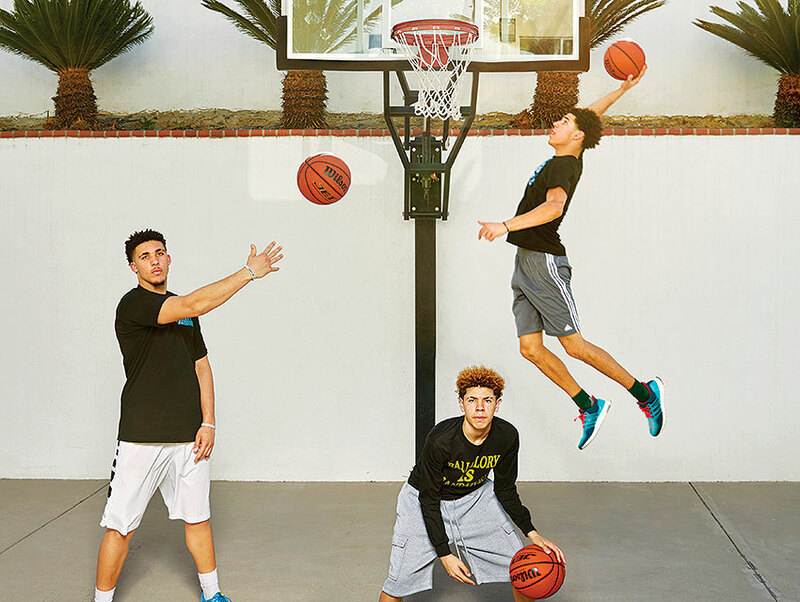 For Chino Hills had a unique triumvirate of brothers at its disposal—Lonzo, LiAngelo, and LaMelo Ball—who were blessed with the ability to routinely make the ridiculous shots you’d see attempted (and missed) by crazed NBA fans competing in halftime giveaways for a free vacation to Hawaii. It had become a familiar pattern. The Ball brothers—all of whom have already committed to basketball scholarships to UCLA—would repeatedly force turnovers, which were quickly converted into layups, dunks, or rainbow three-point shots. And here it was happening again. In the opening seconds of the Mater Dei game, Lonzo, a six-foot-six-inch senior, buried a three-pointer and stole the ball. After two quick passes, LaMelo, a five-foot-ten freshman, hit another three. Moments later Chino Hills stole an in-bounds pass, resulting in an easy layup for LiAngelo, a six-foot-five junior. In less than two minutes, Chino Hills was up 12-0. At the end of the first quarter—only eight minutes in high school games—Chino Hills was leading 33-6. The team seemed to be playing in a different gear, one that made rivals look like Honda minivans trying to lap a Ferrari. After the game, Mater Dei’s Gary McKnight, the winningest high school basketball coach in California history, said he couldn’t remember being beaten that badly: 102-54. “Our guys looked shell-shocked,” he said. By season’s end, everybody’s guys looked that way—Chino Hills finished 35-0, becoming the undisputed top-ranked team in the country. One man who wasn’t shocked was LaVar Ball, a brawny 48-year-old personal trainer who, in addition to being the father of Lonzo, LiAngelo, and LaMelo, has assumed the role of career planner and motivational guru. Many basketball dads get stars in their eyes only when their eighth grader starts draining jump shots. But LaVar, who grew up in South L.A. and went to Washington State on a basketball scholarship before transferring to Cal State Los Angeles, was preparing for this moment before his sons were even born. In the Ball household, everything is part of a master plan. When LaMelo was in preschool, LaVar calculated that the age difference between the brothers was one year off if they were going to play a year of high school ball together. So LaMelo started first grade a year early. When he entered ninth grade last fall, he was still only 13, but after years of playing on travel ball teams with his older brothers, he was ready—on the court at least. It’s not uncommon for star basketball players from public schools to transfer to better-funded private institutions. Many parents think that well-heeled independent schools, which offer scholarships, can better showcase their kids’ talent. A Sports Illustrated study found that between 2013 and 2015 more than half of the nation’s top 100 high school basketball recruits attended multiple high schools, including one top recruit who spent time at seven. That situation is largely a result of the Ball family’s decision to keep their kids at a school just blocks from their home. Add in Chino Hills starters Onyeka Okongwu, a freshman, and Elizjah Scott, a junior, and the team can seem unstoppable. Scott transferred to Chino after his freshman year at Upland High—and had to sit out his sophomore year after the California Interscholastic Federation, or CIF, ruled he moved for athletic reasons. As schools grapple with budget shortfalls, hiring investigators to dig into the most egregious examples of athletic-inspired transfers is a tough sell. “For 95 percent of the principals, what’s going on with the elite athletes really doesn’t concern them,” says Burlison. “Do they want to spend the extra $500,000 a year to hire a half-dozen top investigators to deal with the situation? No way.” The results can be seen on the court, and they are stark. In this year’s CIF Open Division semifinals, it was Chino Hills and three private schools. No other public school made it past the quarterfinals. Watching the team practice under Chino Hills coach Steve Baik, it’s easy to see that for all their shared excellence, the Ball brothers are individuals. Lonzo is highly focused and rarely shows any emotion. Li-Angelo, a classic middle child—levelheaded and low maintenance—has a warriorlike ferocity; when he drives to the hoop, he gives Lonzo an elbow as he lays the ball in off the glass. LaMelo, who’s wearing short shorts that haven’t been in style for decades, is always talking trash. Of the three, he is the most like his showboating father. When Lonzo is slow getting over to cover him, Melo chirps, “Too late!” Then he launches a 25-foot shot from the corner that hits nothing but net.